Swaledale - Who Did What? This essay analyses occupational data in 19thC Swaledale, and how it changed as the century wore on. It is one of a series of essays about the people and communities of Swaledale. I also simplified farm and smallholding sizes to acreages of: less-than-5, 5-to-10, over-10, over-20, over-50, over-100, greater-than-250 acres and over-500, again to make counting easier. You can see the results in Farmers and Farming. Most of the occupations were self-explanatory. But one man was recorded as a "cord winder". We puzzled over this a bit - did he work in a pithead engine room? The OED says that "cord winder" was sometimes a corruption of "cordwainer" so I put him down as a maker of fine leather shoes. 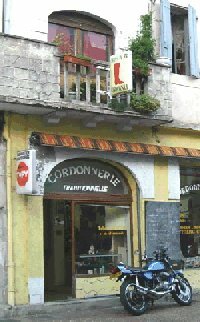 Post script: And on holiday in 2011 we were very gratified to find this busy shop in Castelnaudary. Look - he even has a picture of an elegant boot outside his shop! Admittedly it is an illuminated modern sign instead of a sturdy wrought-iron black boot that would creak very noisily during the Mistral, but he has the right idea. And clearly the French language has been buried deep into our own English lexicon. There were a surprising number of boot and clogmakers in each village (I found this picture of a lead miner's clog on the internet). Most cloggers worked full time but more than one innkeeper was also a clogmaker. Did a corn badger really wear a badge? ... prescribed penalties against the offences of engrossing (speculative accumulation), forestalling, (buying produce before it was offered in market), and regrating (buying and re-selling within the same market or within 4 miles). They required badgers to be licensed by three justices of the peace at quarter sessions and required them to be married householders, of 30 years of age or more, resident in the county for at least 3 years. Household servants or Retainers could not be badgers. In some counties Justices seem to have regularly imposed limits on licences, specifying the markets where badgers could buy or sell, the quantities they could buy or the number of packhorses they could use for carrying goods between markets. I do not know how many of these restrictions carried on into the 19th century, but the corn badger in Swaledale was aged 53, married, born in Keld and living in Muker village. Whilst I was sorting and counting different trades I realised that this information can also be found in trade directories. GENUKI’s Richmond (Yorks) page offers some directory transcripts for some Swaledale parishes so it was easy and quick (thank you) to compare the data. Immediately there are discrepancies and differences. In the trade directories Arkengarthdale has quite a few cowkeepers. Are these called farmers in the census? Not necessarily. Nathan Hall is a labourer in 1881, not there at all in 1891, but a cowkeeper in White's 1890 directory. Post script: I have since been told that a cowkeeper kept cows in town to supply milk to local households - see more in my Migration in the 1880s essay, and the even later set of stories about Cowkeepers in London in the 17th and 18th centuries - researching can take you down some very interesting sideroads. Then I noticed George GARBUTT is in Bulmer's 1891 trade directory as landlord of the Black Bull in Reeth, but he was actually working as a farm labourer at nearby Cogden Hall, and his wife Hannah ran the pub. Maybe this was for legal licensing reasons, but it just goes to show. Having had personal experience of Yellow Pages and other professional directories, I am sceptical about the accuracy and up-to-dateness of all such publications, so it is not wise to rely on them for proof that an ancestor was alive then and living there at the time. My initial hypothesis was that I would find a high proportion of the working population employed in the lead mining industry, so I set out to prove it. The number of people economically active in the dale was far smaller than the total population. It was not until the 1880s that the working population formed more than 50% of the total population, and even then the distribution was uneven. The difference, of course, was the number of children in the district. The upper end of the dale (around Muker) and the lower end (Marrick+Hurst) had an older population than the rest, throughout the 19th century, and therefore more workers in the families. In making the calculation for the following graph I excluded all annuitants, retired people, paupers, wives, daughters helping at home, scholars, children, infants and visitors. I then counted everyone working in lead mining, including owners, agents, blacksmiths, sawyers, carpenters and lead miners' sons. When counting those working in farming I included smallholders (some of whom were also lead miners), shepherds, stockmen, dairy maids, as well as the farmers themselves and their families. There's a significant number of lead mine workers, but not the big majority I expected. So what were the others doing? A few were working in local coal mines and quarries, or generally labouring and carting things about. Early 19thC Low Row had a busy little carpet and woollen weaving industry. A-dozing, on the dunghil fide. "Prithee, friend Richard, fpeak thy case." "The King, the King, is dead and gone." "And, prithee, who fhall have his place ?" "Either Sir George, or elfe the Steward. "Pray God, that neither raife my rent ! "Richard, quoth Hal, and I'm content." There were builders, joiners, stonemasons and dry wallers, clergymen, gamekeepers and gardeners. Hawkers, peddlers, tinkers and roadmenders travelled up and down the dale from their cottages. I am a dry-stone-waller All day I dry-stone-wall Of all appalling callings Dry-stone-walling's worst of all. There were corn millers in Whaw, Reeth, Fremington and Grinton, and corn and flour dealers distributed the flour to the dale's housewives for their breadmaking. Every village had its carriers or waggoners and a sick nurse was never far away, though the only doctor was in Reeth. Police constables were based at Reeth, Gunnerside and in Arkengarthdale. Every district had its own schoolteachers. Most villages had trades which we would find on our high streets today - grocers, butchers, shoemakers, a Post Office, the occasional confectioner, pubs, drapers and haberdashers, hat and bonnet makers, tailors and dressmakers. Local washerwomen provided a laundrette service. The actual numbers for most occupations are in the table which lists the workers who also had a smallholding. There are a few familiar businesses missing. There were no barbers or hairdressers, no bakers (except in Reeth itself), no estate agents, solicitors, betting shops, bike shops, newsagents or bookshops, no New Look or Monsoon frock shops. Mail order catalogues as we know them did not arrive until the end of the 19th century. Especially: there are no banks. It is very likely that much of the local shopping and trade was done on credit, with bills being timed to coincide with pay-day. Traders' account books, where they survived, are a wonderful source of local information. The nearest banks would be in Richmond, or Leyburn. And although there are no County libraries, well-attended Institutes provided a good local alternative, with newspapers, fiction and non-fiction reading, and regular speakers. The National Museum of Wales contains a reconstructed Institute from the same period - the high quality of furniture and decoration, and range of books, illustrates well the pride and literacy of the local community. Some of the missing High Street shops could be found in the county town of Richmond, about 10 miles down-river from Reeth. This was a busy and prosperous town with a wide range of trades and services, private academies and dame schools, and also the local magistrates court, jail, tax office, and so on, and a population of about 3,500. But even Richmond did not get a dentist until 1890. The following information is based on the Richmond trade directories published on Genuki's website, and excludes services also available in Swaledale. Be aware that there is a 50-year gap which I have yet to fill and which might explain that otherwise astonishing growth in insurance agents and lodging houses! Full-time farmers and the declining lead-mining population are the subjects of separate essays. Many of the residents of Swaledale worked a piece of land in addition to their main employment, and so called themselves "something & farmer" in the census. Unfortunately the 1881 censuses for Reeth, Healaugh and Grinton did not record the acreage of farms, which explains the high number of "not given" on the 1881 graph line above. Data from the other censuses suggest, however, that the majority of those "not givens" would be distributed between the smaller-acreage farms. They were a varied lot. Nearly half of all innkeepers had a bit of land as well as the pub. And the numbers of carriers suggest that some small farmers used their waggons for the greater good. But the majority of smallholders were lead miners, who traditionally worked the lead seams in winter and their farms in summer. The following table lists all those jobs done by people who were also "& farmers". This list is so nearly a complete list of all the occupations in the dale that I have combined two sets of counting in the one table. The first column for each decade shows the number of "& farmers". The second column shows the total number of people carrying out the main occupation. So in 1851 there were 35 blacksmiths in Swaledale, of whom two also had smallholdings. The only missing occupations are those concerned full-time with farming, with the woollen and hosiery trades, domestic service, hat- and stay-makers, some plumbers and plasterers, schoolteachers and the occasional craftsman. And in 1861 the Vicar of Grinton reported a glebe of 10 acres, but I don't expect he dug it all himself. 1901: four grocers, one postmistress. And of course all the dressmakers, bonnet-makers, staymakers, stocking-knitters (most of them), a few schoolteachers, were women, many of them married. But it does seem that for the vast majority, being a wife was a full-time job. PS Aug 09: One of the Dalesfhg members sent this photograph of the wedding dress made by dressmaker Jane METCALFE (daughter of miner William and Rosamond [Alderson] of Muker) for her marriage to John HILLARY at Marrick church in February 1872. John's parents were John (a mining agent) and Isabella Hillary of Slack Hills House, and his younger sister Susan was also a dressmaker. At the time of her wedding, Jane measurably had an 18" waist, and the elegant dress is a fine display of her dressmaking skill. The pink/brown tafetta dress is lined, trimmed on the bodice and sleeves with parallel bands of bright blue velvet ribbon, and has a tiny fringe of lace at the edge of the cuff. The skirt hem is bound by a protective brown velvet band. The dress was carefully kept in the family and the illustration was specially made for this essay. My thanks go to the Coates-Wood family. In the 1881 Hurst census, Jane was recorded as the sewing mistress at the Board School - probably the one in Marrick. By that date John had left lead mining and become a stonemason and farmer, and they had four daughters. I hope the teaching job was only part-time because Jane had no live-in domestic staff, but John's sisters lived nearby. John and Jane's eldest daughter became a dressmaker herself, in due course, and in 1901 Jane's widowed father was living with them at Slack Hills. In 1871, 81 and 91, one locally-born teacher spanned three censuses. Maybe the teachers in 1841 and 1851 were Sunday School teachers? I don't know. From 1851 onwards, the five Church of England vicars were augmented by two or three non-conformist ministers. It seems that clergymen were made elsewhere, though I expect most of the dalesmen went to church or chapel. I was interested to see how many families had live-in domestic staff. All middle class landowners, clergymen, agents and farmers had at least one house servant. But so also did tailors, grocers, blacksmiths, and even some miners. The census records many daughters as domestic servants, particularly in the larger villages. It is impossible to tell, now, how many of them were just helping at home and how many were actually employed by someone else in the village. So this first chart, which shows the proportion of households with domestic servants, only counts those girls and women whose relationship to the head of household is shown as "servant" in the censuses. The peak year in Grinton was 1871, where 21% of all households had at least one maid. Sisters, nieces, grand-daughters and so on shown as domestic servants are not counted. Nor are those who are "housekeepers" or "helping at home", or helping on the farm. In the 1841 censuses, where relationships are not always given, I have only counted those domestic servants whose surname is different to the family's name (they could be step-daughters, I know, but not often). This dale-wide total does not show the distribution differences. The two districts with proportionally fewer children (Muker and Marske) have a slightly higher proportion (1% - 2%) of households with domestic servants. For comparison, the following is the same graph but it counts everyone described in the censuses Occupation column as a domestic servant. It still does not include those unemployed daughters whom I have designated as "helping at home", or housekeepers, or farm servants. This shows that a further two or three percent of Heads of Household regarded their daughters as servants. I hope they could not get away with that today. When investigating 1851 family sizes I checked to see how many families of young children had some form of live-in help, either from a domestic servant or a family member. The result was 7%; much less than the average of 13% shown here. So, not many au-pairs or nannies in 1851 Swaledale, then, though one little 11-year old was described as a nurse. A number of mothers-in-law were shown as ‘visitor’ in the census when there was also a tiny baby in the house. My mother came to stay when our children were born and I cannot see why it should have been any different 150 years ago. And somehow families had to cope when the mother died after giving birth. A ten-year snapshot of family events will of course only capture a few such times. In 1881 is the first mention of a foster child – in fact there were two of them: one a baby of 1 and the other a boy of 13. And in 1871 a 2-month-old was described as a “nurse child” (presumably being cared for by a wet-nurse) whose father is almost certainly the 30-year-old widower lead miner living nearby, alone. One Langthwaite grocer, father of 4, sent the 2-month-old baby to his mother (she was 73). The fourth had his mother, a nurse, living in, as well as a domestic servant called Margaret (aged 23 in 1851). The baby survived, he quickly remarried (wife Margaret, age 31 in 1861 – the former domestic servant, I wonder?) and had five more children before 1861, by which time his mother had moved to live with her married daughter and her children. This 1851 death rate, 4 out of 199, was 2%, which I think is about what it is today, and actually less than the average of 4% in 1851. Everyone had a job. Every child helped out; every sister and daughter had responsibilities in the household or on the small-holding; every son ran errands and carried and fetched for his mother; every grandparent contributed time, or advice, or baby-sitting, probably as well as doing a paid job at the same time. Very few people retired - there were no pensions and the Guardians were to be avoided at all costs. Out-relief was paid by the Poor Law Guardians in cases of short-term illness or accident, but mostly life was precarious and a busy and hard-working household could be devastated by floods, or accident, or early ill health. No wonder many families emigrated - either to relatives overseas, or to live near friends and relatives who had already made the journey to the mill towns of Lancashire and the West Riding.